In traumatic situations, it may be instinctive to flee as soon as possible. A car accident is a good example of this. However, if you are in a car accident with a power line, the safest place is often inside the car. 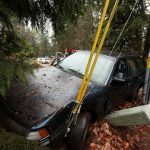 When a car crashes into a power pole, the pole may fall down, lines may fall on your car or nearby, and the area around your car may become charged with electric energy. If you stepped out of the car in this scenario, your body would become the path to ground for the electricity, and you could be electrocuted. While downed lines can sometimes show they are live by arcing and sparking with electricity, this is not always the case. Power lines do not always show signs that they are live, but are just as lethal. Stay in the car if you are in a car accident with a power pole. Warn those who try to come near your car to help that they must stay far away. Call 911 for help, and wait until a professional from the electric utility tells you it is safe to leave the car.